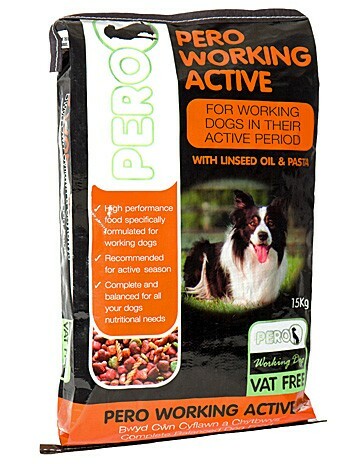 Pero Working Dog Active is a high performance dry food which provides your dog with maximum energy and vitality during their working periods. It contains a carefully balanced formula of meat products, cereals, fats & oils, vitamins, minerals, trace elements, linseed oil and pasta, which together give your dog the carbohydrates for maximum and sustained energy during periods when they require their peak fitness. This food can be fed dry or mixed with water or gravy if your dog prefers. Extruded Cereals, Meat Products, Flaked Cereals, Animal Fats, Pasta, Fish Meal, Vegetable Oils, Vitamins and Minerals,Vitamin B1, Vitamin B2, Vitamin B6, Vitamin B12, Biotin, Folic Acid, Nicotinic Acid (Niacin), Pantothenic Acid from Calcium Pantothenate, Deoderase – a natural extract from the yucca plant to aid in neutralising offensive odours. Protein 25%, Oil 10%, Fibre 2%, Ash 7.5%, Vitamin A 11,000 IU/kg, Vitamin D3 1,200 IU/kg, Vitamin E (Alpha Tocopherol) 125 IU/kg, Copper (As Cupric Sulphate) 25mg/kg. There are currently no questions for Pero Working Dog Active Dog Food - be the first to ask one!